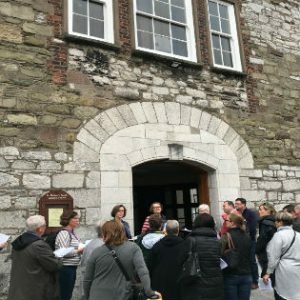 On May 21, 24 pilgrims, including Fr Darryl Mackie and Sr Helen Clarke rsc, gathered in Dublin to begin their journey around the sacred sites that are integral to the Mary Aikenhead story. Pilgrims were drawn from across Mary Aikenhead Ministries: Some were from education and some from health care; one staff member from the Sisters of Charity office; and Sr Maureen Heffernan (as a Sister of Charity). In addition, this year the group was were honoured to have Bishop Terry Brady (an Auxillary Bishop of Sydney) as a pilgrim. Bishop Terry and Father Darryl shared the liturgies at various sites. The pilgrimage took us from Dublin, to Cork, to Galway and Foxford, then back to Dublin, then Glendalough for two reflective days. A highlight of the pilgrimage was meeting the Sisters of Charity in different places and accepting their hospitality. Sr Mary Christian, Congregational Leader of the Irish Sisters of Charity, hosted our opening liturgy and dinner at Sandymount, Dublin, and the Sisters of Charity criss-crossed across our paths throughout the entire pilgrimage. Each day, pilgrims were encouraged to journal and then reflect on three aspects, “what did I learn today?”, “what touched me today?” and “what will I take back to my ministry?” – head, heart, hands! 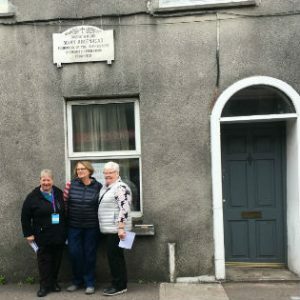 The pilgrimage ended on Tuesday, May 30, when pilgrims were delivered back to Dublin Airport, after nine days together in the country that was home to Mary Aikenhead, the early Congregation of the Sisters of Charity, and our sister Congregation. There was such excitement, knowing that I been selected to go on the 2017 Mary Aikenhead Ministries Pilgrimage. All of the Sisters in Queensland were, I think, equally excited for me. I had been told by former pilgrims that the experience was life-changing, so I was determined to find out why this was so. On the first day of the pilgrimage, a very excited group of pilgrims met in Dublin. I had met the other pilgrims at the commissioning in Sydney a fortnight previously. We were warmly welcomed to the convent in Sandymount by the Sisters in residence. This hospitality was to be repeated wherever went in Ireland, when meeting the Sisters. The Sisters were truly happy with meeting us all, which enhanced our experiences greatly. 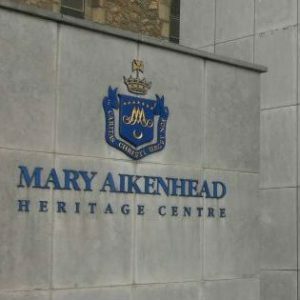 The Mary Aikenhead Heritage Centre was inspirational. To see where Mary worked and lived and the displays eg video and photos of other Sisters throughout the years engaged in their ministries was very interesting. 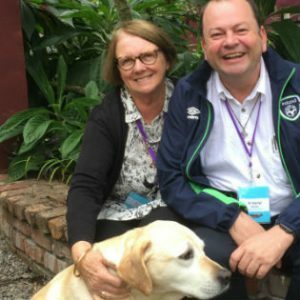 I was very excited to see Sr Anne Crowley there in a video and a photo, because Anne is one of the Sisters in Queensland whom I care for. Anne has often told me of her work in Zambia, but to actually see photographic evidence was wonderful. I couldn’t wait to return home to share this experience with her. To follow in Mary’s footsteps was truly inspiring. What a dedicated woman she and her followers were. It was awe-inspiring to think that all of those years ago these women were undaunted by the obstacles they encountered when they were trying to better the lives of their fellow man. 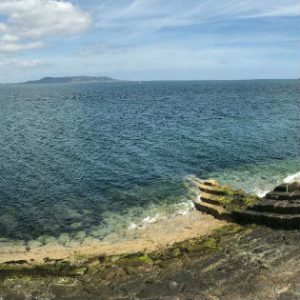 Standing on the shore at Dun Laoghaire imagining the Sisters as they set sail for Australia, never knowing if they would see their homeland again, was very sobering. Walking the streets of Cork and visiting St Vincent’s College in Cork where the students showed such enthusiasm at meeting the Pilgrims was very special. Again, hospitality was at the fore. We also visited Marymount Hospice where dedicated staff and 600 volunteers work to make this a very peaceful, caring environment. Knock was awe-inspiring, and to have Bishop Terry Brady and Father Daryl Mackie preside at the Mass was a real highlight of our pilgrimage. Foxford in Co Mayo was also very moving. The story of Sister Mary Joseph Arsenius (read her story on Wikipedia, under Agnes Bernard) and the establishment of the Providence woollen mills there showed that she was a determined woman ahead of her time. The story of Sister ignoring the town council to bring equipment over a bridge when told not to, bought a laugh to all the pilgrims. Glendalough was such a wonderful place to complete the Pilgrimage. The tranquillity of the setting and the ancient buildings was very spiritual. The end of the Pilgrimage was a bitter-sweet experience. As a group, the pilgrims had bonded and cared for each other. I’m sure that Mary would have been very pleased to see such a diverse group of people coming together in her name. The sweetness was coming home to share my experiences and multiple photographs with the Sisters. I felt that it has changed my life in as much that during difficult times, I can think of Mary and those other early Sisters who though they lived in hardship, through sheer determination and faith made their communities better places in which to live and also the Sisters who came after them who have carried on Mary’s legacy. A pilgrim is one who follows a sacred path – an intentional journey. Our Mary Aikenhead Ministries pilgrimage from May 21 to 30 this year was just that – a journey back to our Congregational roots, moving to a deeper understanding of the life of Mary Aikenhead and her intentions that those who would join with her in ministering to the poor and needy would do so with tender concern, practicality, and respect for each one’s dignity and worth. Before leaving for Ireland, each pilgrim was acknowledged and blessed at the Mary Aikenhead Ministries conference. In this moving ritual, each pilgrim received an Aboriginal journey stone and scallop shell as special symbols of our quest. Many of us have encountered the Irish saying: Céad míle fáilte – “A hundred thousand blessings! A hundred thousand welcomes!” – and welcomed we were in Ireland. Each place we visited the welcome was warm and enthusiastic, the hospitality exceptional: Each was significant in its uniqueness. One of the special places for us was the Heritage Centre at Harolds Cross, following Mary Aikenhead’s life story through a diaroma which depicts significant moments of her life both personally and for the beginnings of the Sisters of Charity. Mary Aikenhead lived here for many years, and it was where she died. Here sits the Round Table, where she wrote thousands of documents, including letters begging for financial support for the growing needs of the poor she was so aware of, letters of encouragement and guidance to many Sisters. A moving moment for me at the Heritage Centre was gazing at the picture of Mary Aikenhead in the habit, a picture we are so familiar with – this particular image had such clarity. Looking into her eyes felt so real; I truly felt her presence, her encouragement, and a deepening call to integrity and service. It was a great joy to visit St Vincent’s School in Cork. The dedicated principal spoke to us at length about their programs and hopes for their students: “We want the girls to be happy!” It was impressive to hear that as the most important goal for these girls. We were treated to spending some time with some of the girls who had prepared some items – in song and artwork for us and who had asked to hear something of life in Australia. Sharon Volp, Principal of Mt St Michael’s, Ashgrove responded superbly, eliciting questions from the girls and suggesting future links between the colleges. At Cork Cathedral, we participated in a beautiful paraliturgy around the Baptismal Font, gathering to remember the gift of faith and our continuing commitment to our Baptismal promises. The poignancy of Dun Laoghaire from where the first five Sisters departed for Australia and the Museum at Cobh, graphically portraying the enormous suffering of poor people banished from their families and homeland, never to return, has left an indelible mark of the suffering of loneliness, insecurity, fear, which I now associate with the many refugees and asylum seekers of today. Halfway through our time of pilgrimage we visited The Sanctuary, established by Sister Stanislaus Kennedy rsc. This is a place of refuge from the busy-ness of modern life, an oasis for troubled souls, place of welcome for the homeless. Here, a beautiful open garden offers tranquil and restful spaces to sit and dwell a while. Inside the building there are quiet nooks for group gatherings and individual reflection. Much work has been done and continues to be done for the homeless by Sr Stan and her colleagues. We visited Donnybrook, place of eternal rest for Mother Mary Aikenhead, Sister Mary Baptist de Lacy – one of the first five Sisters who came to Australia – and many Sisters of Charity and women who had been in the care of the Sisters.